Kibinai – national heritage. | KIBINAI – national heritage. No freezing. Kibinai are cooked and baked immediately. Ancient culture – national heritage. Kibinai – a dish of Lithuanian Karaites Nr.1. Tasty and very popular in Lithuania. Kibinai. Trakai. National and cultural heritage of Karaites. Kibinai – national heritage of Karaites. Probably nothing nowadays represents so highly nation as food. For delicious, juicy and so loved by all kibinai we have to be thankful to nation of Karaites. In Lithuania there is great place, where Karaites live and today. Trakai — is the town, which is located approximately in 30 kilometers from Vilnius. It is surrounded by lakes on all sides and on one of these islands of lake Galve there is Trakai castle. Trakai castle was founded in the 14th century by Lithuanian Grand Duke Gediminas. Grand Duke Vytautas built in the beginning of 15th century another – island castle. How it is wonderful to sit just on the bank of the lake or near a convenient little table at restaurant or cafe with kibinai in a hand, to enjoy eating and to admire an ancient castle on the island, slowly puffing steamship or the yachts, floating slowly – nothing can be better. Trakai, beautiful nature and kibinai. City name Trakai is inseparable from culinary heritage of Karaites. In Trakai Karaites made popular dish kibinai, which distributed across Lithuania. It is crescent-shaped cake of yeast dough with a filling of chopped lamb or beef, baked in oven on baking tray. Kitchen of Karaites has no traditional drink, which is the most suitable with kibinai. Kibinai is suitable anytime, anywhere. When you eat it, you may drink natural hot broth, tea, bread kvass or tincture of Karaites. The traditional alcoholic drink of Karaites – “Traditional tincture of Karaites”. It is made from various herbs, roots and Eastern seasonings. It was believed, that drink, which is made from cumin, is the best suited with kibinai, but this is a fiction, which was invented in Soviet Union times because of the meager selection of beverages. Currently about 65 Karaites live in Trakai, and on Karaite street houses, schools, chapels of the community are restored. Today Karaites traditionally live in Crimea, in some cities of the Western Ukraine (Lvov, Galich, Lutsk) and the district of Trakai in Lithuania. Who are the Karaites, which had such cultural influence on Lithuania’s national heritage? 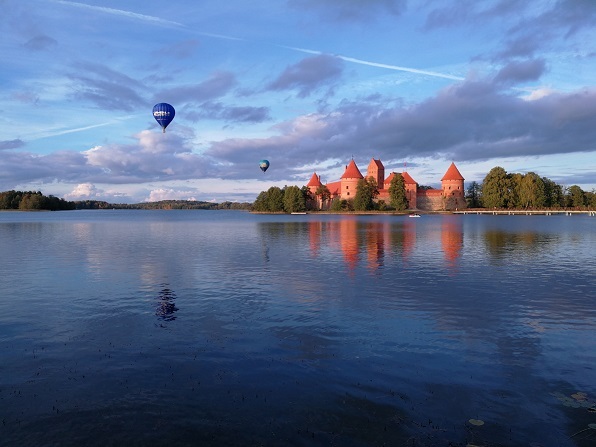 Why do we treat guests to kibinai, not zeppelins in Trakai? 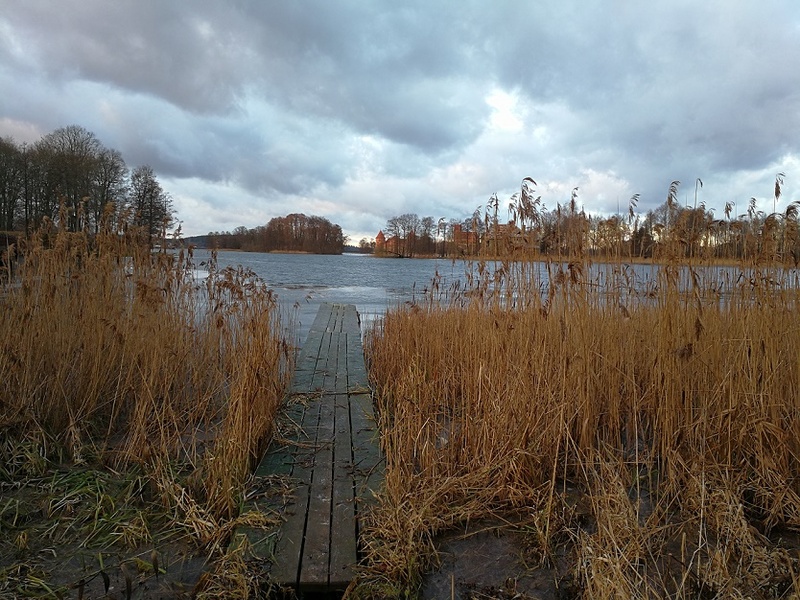 Now about everything together: about Trakai, Karaites, and, of course, about kibinai. The origin of Karaites and their accommodation in Trakai. Karaites come from the ancient Turkic tribes – Cumans, Khazars, Uzuns. These tribes once formed powerful Kanagat of Khazars, whose lands are placed even on Northern coast of Caspian sea, and the capital Itil was in outfall of river Volga. One of the exclusive features of Trakai is fact, that in town for more than 600 years live small nations, one of them – community of Karaites, which for centuries preserved tradition, beliefs, customs and language. To some purpose Trakai is called capital of all Karaites in Lithuania. History of Karaites is related to Trakai and Lithuania since 1397-1398. It occurred after the Duke of Lithuania after a campaign to the Crimea removed some hundreds of Karaite and Tatar families from there. In the beginning Karaites were lodged in Trakai between two castles of the Grand Duke, in northern part of the city, in present Karaite Street. Then settlements of Karaites arose and in Panevezys, Birzai, Pasvalys, Naujamiestis. They were engaged in craft, trade, but their main difference was, that they were personal cooks at court of the prince. Men also served as bodyguards of the prince Vytautas, and also they protected approaches to the Trakai island castle. Women were engaged in needlework and agriculture, were perfect gardeners, especially they became famous for unusual sort of cucumbers. Karaites also were very courageous and brave, than became famous and in Gryunvaldsky fight. Vytautas grew from their loyal defenders and warriors. As we could understand coming of the Karaites in Lithuania directly is related to the name Grand Duke of Lithuania Vytautas. Historians mention great campaigns of Vytautas against Tatar horde of Azov, during which at the end of XIV century battles of Lithuanian army took place with the Tatars on their land and Solkhat areas. After reaching victory in these battles prince Vytautas brought to Lithuania 383 families of Karaites. Moving of them and several thousands of Tatars was repeated. It is associated with the state policy of the Grand Duke of Lithuania Vytautas in those times – to accommodate empty plots of land, to build castles and cities, to revive trade and economic life. Grand Duke Vytautas brought Karaites to Lithuania as warriors and honest servants. He placed them on the open area of city in those times between the peninsula and the island castle, in the present street of Karaites. Lithuanian Grand Duke entrusted the Karaites of the castle protection. The Karaites were skilled craftsmen, wit vegetable growers. Vytautas gave them many privileges. Others, knowing that compatriots live here not badly themselves arrived in Lithuania. Karaites of Trakai still retained their language and some customs. Settling in Lithuania, the Karaites formed separate community in Karaite called Dzhimat. Duke Vytautas was called Vatat Bij by Karaites. This name translated from their language, meant “king crashing enemies”. Karaites highly respected him and worship to this day. Karaites of Trakai constituted two groups, engaged in various activities: military and civilian. The military guarded the castle and bridge in the island castle, civilians mostly worked the land. They were famous for horticulture and animal husbandry. Like other inhabitants of towns, the Karaites were engaged in handicrafts, trading, held taverns, rented customs. Grand Duke Vytautas trusted Karaites and he and other rulers of Lithuania expressed confidence by providing privileges for their community. In 1441 the Grand Duke of Lithuania Casimir Jagiellonian gave them the right of Magdeburg self-government. With self-management Karaites could build house of worship, practice their religion, to develop the culture and customs. They were directly under the authority of elected by them vait of Trakai, which has administrative and legal authority. Vait was responsible to the ruler of Lithuania. Thus, in Trakai two independent parts of the community were formed, which have separate rights of Magdeburg self-government, established territory, power, symbols, and even the names – Greater and Lesser Town. The Karaites, as a nation, and Karaism as religion, derived from the word “kara” which means “to read the scriptures”. Karaite faith is essentially faith of the Old Testament, their dogmas are based only on the truths written in the Bible, and do not recognize any comments on these sacred texts, either orally or in writing by authorities. It is believed, that the doctrine of Karaite religion emerged in the VIII century in Mesopotamia. The first temple of Karaites Kenesa in Trakai was built in the fifteenth century. During the period of its existence, it repeatedly burned, destroyed and rebuilt again. The current Kenesa renovated in 1904. Work was carried out on the initiative of the Karaite clergyman Felix Maletskisa and using collected funds. Work is also facilitated by the engineer Mikhail Prozorov. Square-shaped Kenesa is one-storey, two-room building. It is worth noting, that during prayer time men and women should be in separate rooms. In the hall, the male part, they can get from the porch. The same porch is equipped with a staircase to the balcony – women part. Balcony is supported by 4 wooden columns. The ceiling of the room – an octagonal dome. The roof has four slopes, two stages, above it there is a quadrangular lantern. Kenesa is not only a house of prayer, but also the center of the spiritual life of Karaites. The solemn ceremony, which Karaites take up till now, is wedding, called “toj”. On the occasion of the birth of girls “kutlamah” is arranged in Kenesa – a prayer of blessing and giving a name. On the occasion of the birth of boy celebration was even greater once. The name of newborn is also advertised in the Kenesa. Usually any guy sings a special song for the occasion. One of the most famous Lithuanian Karaites was Dr. Hajj Seraya Khan Shapshal, who lived in the nineteenth-twentieth centuries. The former chief cleric of Crimea, and later of Karaites from Poland and Lithuania, called “hahan”. Shapshal – famous spiritual and cultural leader of Karaites in Lithuania. On the basis of his personal collection ethnographic exhibition of Karaites was arranged. It is necessary to pay attention to the wooden houses of Karaites in Trakai. Many of them with three windows facing the street. According to legend, after his victory in the Battle of Grunwald Vytautas decided to thank all the foreigners who participated in the battle, which helped to achieve victory. – I wish you long years of management, wise and righteous ruler! – Thank you for your good wishes, faithful foreigner,- said the ruler. – It’s your turn to ask for your people for their faithfulness and courage. I will do all that I can. – Did you risk your lives only because of it? – No, the Grand Duke, – said the old man – not for it, but because of peace, because a bad peace is always better than a good war. Our request would mean, that everyone who will see the house with three windows would know that they worship God, we always loyal to the prince, and they are always welcome guests. Vytautas liked the words of my grandfather, and only for them, the Karaites, for faithfulness in Trakai allowed them to build houses with three windows facing the street. Kibinai- special gift of Karaites to Lithuania. Women of Karaites are famous for being good hostesses, thanks to their hard work cuisine of Karaites remained until today. Its basis – products from dough and meat. Karaites have different folk dishes. Some of dishes are designed for everyday, the other for holiday, most often associated with religious holiday, table. One of the most famous dishes, which is unrelated to the rites in Lithiania, is kybyn (Lithuanian “kibinai”). Kibinai (in the Karaite language “kybyn”, plural “kybynlar”; in Lithuanian kibinai) is national pie of Karaites. It is one of the most known dishes of Karaites. It is crescent-shaped pie with a stuffing. This surprising dish became exclusively popular in Lithuania thanks to the Grand duke Vytautas. Karaites in 1397 — 1398 located in Grand Duchy of Lithuania. And also Karaites baked for soldiers special mutton pie – kibinai. Vytautas and his confidants liked such pies and kibinai became constant dish on a princely table. In 1997 in Lithuania 600-year anniversary of the settlement of Lithuanian Karaites and Tatars in the Grand duchy was celebrated. Now in Trakay about 65 Karaites live. Karaites kept the language, the writing, grew up not one famous scientist, the cultural figure. Exactly because of the cultural influence of the community of Karaites and because of all the other above mentioned circumstances of Karaites folk influence kibinai and entered the Lithuanian cuisine. Kibinai are very popular in Lithuania. Karaites are adherents of Karaism, that is a special form of Judaism, they use as the kosher meat, allowed by their religion, only mutton. Kibinai, which stuffing is prepared from mutton, is 100 percent kibinai of Karaites, but having lodged in new residence, considering local animal husbandry and tastes of new owners, Karaites began to bake kibinai with beef, and also with fowl. For this reason today in cafes and restaurants of Karaites they will offer you the most delicious pies kibinai from fresh dough with various stuffings (pork, venison, beef, mutton, turkey, chicken, mushrooms, etc.). Now this the most delicious dish became very popular and therefore there is a set of various options. Now it is possible to find even kibinai with sweet stuffing, cottage cheese and vegetables. 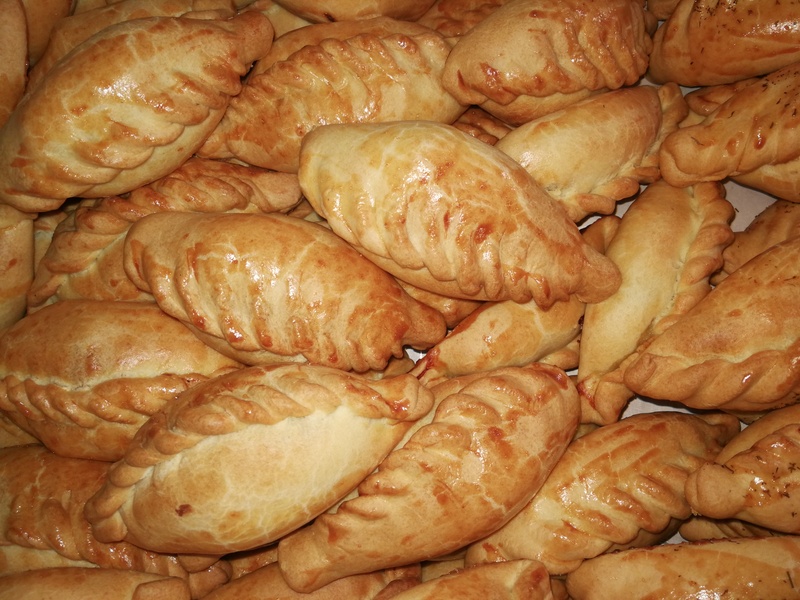 Form of kibinai is like crescents, and their size is like size of cheburek, which habitual to us. Try them with beer or with broth – simply fantastic taste! It is absolutely simple to prepare them. Kibinai is a remarkable dish both for you and for your guests. Ruddy pies with crackling dough and gentle, juicy, soft stuffing simply melt in the mouth. Besides kibinai do not lose the wonderful taste even, when it is cold, they can be taken safely with you in the road or for lunch in the work. They are extraordinary tasty, crispy, juicy and very nourishing!!! PIES. KIBINAI. DUMPLINGS. VIRTINIAI. “PEROGI”. Everyone understands and knows what history is, so when we start talking about the history of gastronomy we start with the notion of gastronomy, as we find its description in public access sources. Gastronomy – (French gastronomie, under the name of Berchoux) the poem Gastronomie (Gastronomy) was written in the seventeenth century, devoted to the art of cooking, from here – ironically science of the abdominal order: gastro- < Greek gaster, origin gastros stomach + nomie analogically according to astronomy – the science of the laws of the celestial bodies): 1. the science of cooking; 2. ready-made foodstuffs – butter, cheese, sausages, meat, fish, salads, caviar, beverages. Unambiguously, kibinai are part of the gastronomy, and the kibinai production science is part of the science of social gastronomy, which includes the history of gastronomy. KIBINAI donated by Karaim to Lithuania are part of the Lithuanian historical gastronomy. The Kibinai were donated to Lithuania by Karaim. We must be grateful to this nation for all of our favorite pastries. The contribution of the Karaim community to the Lithuanian historical gastronomy is obvious and indisputable. Perhaps it has often been noted that kibinai are like oven-baked dumplings. The similarities are, in fact, uncontroversial, because they are masterpieces of historical gastronomy, which is “hidden” in the current daily dishes. Kibinai’s brothers are smaller dumplings. When dumplings, virtiniai ar virtinukai are loved in our country, it’s not exactly known. Of course, only one thing is known it has happened long ago. Most likely, a wide variety of cakes made from wheat flour dough came to Lithuania along with the first wheat. Another significant part of historical gastronomy is taken from the “southerners” who arrived from the 14th and 15th centuries: Tartars, Karaites, Jews. Dumplings. Dumplings are considered has Turkish origin, but Kundum is a Tatar word, which is translated as a “festive dish”. It is interesting to note that in 1868, the painter and the expert in the history and traditions of Suvalkija Alexander Osipovich wrote about the Tartar of Vinshnupis: “… they also gathered together and ate the folk dish – dumplings. This is a dish wrapped in a dough with a knife chopped meat with sheepskin, pepper and onion. In Warsaw, they call them the Lithuanian Dumlings, which are called the Tartar here more correctly. Great dumplings, very delicious, but you need to know how to make them, although it looks like a very simple dish. They eat it with a spoon. The most important thing is to duck the whole dumplings without dipping the dough and not pouring juices, which are just like a lunchy gourmet. In the decades of the 8th and 9th decades of the Tartars living in Suwalki, for dumplings it has been used the best meat with kidney fat. The dough should have been very thin, but at the same time not to break, so that fat should not run out of it. Dumpling edges has tooth. They presented horseradish to them, but did not fill with the butter …. The oldest recipes found in Lithuania were found in the book of the Radvila cookbook of the 17th century. Dumplings are called “pierogi” in Polish, and in Lithuanian we could say “cakes or pies”. It is very similar, but does not become dumplings. “Pierogi” can be of two types in the choice of dough. They can be made from yeast and unleavened dough. In the nineteenth century, these cake dishes were very much liked by the noble Tyszkiewicz manor houses in Lithuania. The famous intellectual of that time, one of the founders of the Antiquities Museum in Vilnius, Eustachis Tiškevičius, distributed his recipe in Vilnius. The dish to honor the dish is still called Tiškevičius (sometimes Lithuanian) dumplings. As with Lithuanian cuisine, the filling of these dumplings was “enriched” with forest mushrooms. An authentic recipe for a dish is found in Vincentina Zavadzka’s 1907 Lithuanian Cookbook. Here are some of the most unusual and interesting paths of cakes, virtiniai, dumplings. Most probably came to our country with the “southerners”, joined the local culture of gastronomy, and thanks to the nobility, the authentic written recipes were preserved and survived to this day. This is such an interesting story about our favorite cakes in Lithuanian historical gastronomy.